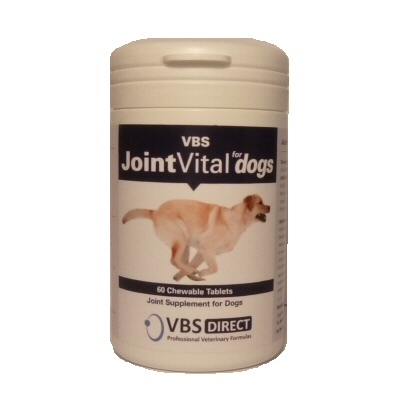 VBS Direct Ltd - VBS JointVital for dogs (60 Chewable Tablets) - Innovative solutions for the veterinary professional. JointVital contains a comprehensive, unparalleled blend of ingredients at optimum levels designed to help maintain joint function. It combines the best ingredients available to make the most complete formulation on the market. It is designed to support the joint rather than treat the signs of pain and inflammation. It can be used in combination with prescription medications and has no known side effects. Can be broken and mixed with food or given as treat. After the initial dose period, the daily amount can be reduced by half a tablet per day for the following week. This can be reduced on a weekly basis by a further half a tablet per day until a level of half the initial dose is reached. If your dogs condition deteriorates during this period please contact your vet. Registered Vet Practices may order VBS Direct Pet Supplements direct from http://www.vbs.vetorder.co.uk. Account registration is easy and once setup you can place all your orders via this simple to use portal.